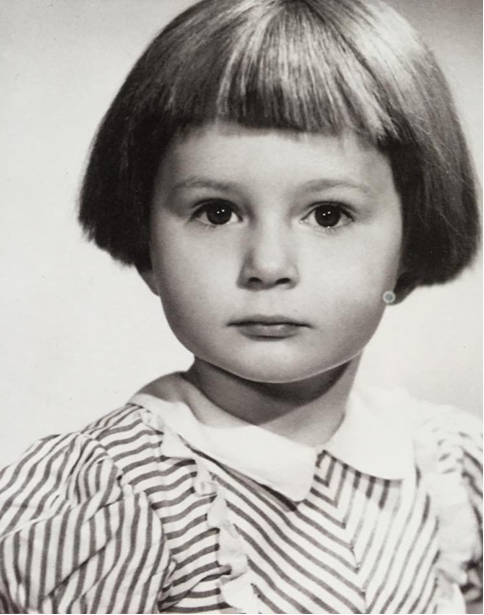 I was born in 1947 in May to a mother who was 45 and a father, 35, and who was still in Germany. My mother had been born into a wealthy household with servants, and was one of seven children who lived with every comfort available. The older ones were schooled abroad until WWI. She met my father during WWII 'doing her bit' as a nurse on the officer's ward. My mother's family have a long line of psoriasis going back to the 1800s. My father had Ehlers-Danlos type VIII. I was born weighing 5lbs 12ozs and was very undernourished. My father was so shocked when he saw me that he rushed out and bought the most expensive baby milk, which, he said, I promptly vomited up. We lived in a tiny terraced house in Southall and by 18 months I had a lazy eye and an umbilical hernia. I was very early vocalizing and very late walking at 23 months. This photo shared here is me at age three: little did I know what life was going to throw at me. I remember it took ages to capture this without a squint. I would get terrible mouth ulcers and as I have no gag reflex was hooking foul lumps out of my tonsils. From aged three onwards I was going to Hillingdon Hospital for my hernia and The Western Ophthalmic hospital for my eyes. The squint was corrected just before my fifth birthday but I wasn't allowed to see a film, look at a book, or go to school until I was six and a half and the hospital said this was ok. When I was eventually allowed to do these things I promptly caught measles, complicated by viral pneumonia, I was very ill and this triggered two years of incapacitating migraines. Somehow, I passed my 11+ and I moved to a state grammar school in Coulsdon. My parents didn't move and I was quite badly affected by the separation as I didn't know anybody, nor could I contact my parents as they didn't have a phone. Life got worse after this, a year after starting at the grammar school I developed polycystic ovary syndrome (PCOS) and my teeth started to disintegrate. My dentist and I couldn't understand why. Then at age 15 my GP told me I would never have children. How wrong he was! I became engaged when I was 19 and married when I was 21. In that time I had my first experience of almost dying as a wisdom tooth abscessed and I developed lockjaw whilst up at Cambridge. By 21 I realise, thinking back, I had every symptom of Sjögren's Syndrome. Our first son was a cot death but quickly followed by sons two and three, plus our adopted son. We were a proper family. Life became very busy and we moved to another area in the village. The last pregnancy was terrible and I had severe morning sickness for 38 weeks. That started my decline health-wise. I was diagnosed with ME (Myalgic Encephalopathy) and shortly afterwards started to feel faint and then sweat very badly this is a condition called hyperhidrosis. My symptoms of Irritable Bowel Syndrome became much worse too. I was also often feeling cold and very tired. A new dentist I was seeing suggested Sjögren's syndrome. My GP sent me to see at least 50 consultants who suggested various operations which have all failed. It was then that my dermatologist said I had lupus and started me on the drug methotrexate. By this time the bank was broken and so we had to ditch private healthcare. My husband was just getting over prostate cancer when the local rheumatologist told me I was wasting clinic time and that there was nothing wrong with me. Six months later I was so ill my GP feared for my life and I struggled up to St. Thomas Hospital in London to be told “of course you have Sjögren's Syndrome, get back on the Methotrexate". I finally ended up with my present rheumatologist who is lovely: I mentioned to her that I was hyper-mobile and she agreed and that I had postural orthostatic tachycardia syndrome (PoTS). Last year I went back to University College Hospital in London and they have confirmed that I have lupus, Sjogren's syndrome, psoriatic arthritis, Ehlers-Danlos syndrome (EDS) and that I have an underactive thyroid. I also have PCOS and fibromyalgia. I joined Cloudy with a Chance of Pain to spread knowledge about pain conditions. I believe that the weather affects us all, I personally would like to live in the dark: at the moment my top half is sweating and my bottom half is like ice. On the 27 of September I am going to the genetics clinic to see what type of EDS I have, I think I might need an upright MRI scan as I have every symptom of Chiari (a structural defect in the cerebellum, the part of the brain that controls balance) apart from nysagmus (continuous uncontrolled movement of the eyes). It's only taken 69 years but I'm determined to find out as much as I can. Nobody else should suffer a life of pain and become a cripple because a consultant never thought to ask “are you double jointed? "!